Traditional marketing by word of mouth will always be considered as the number one way through which we move people to make decisions. 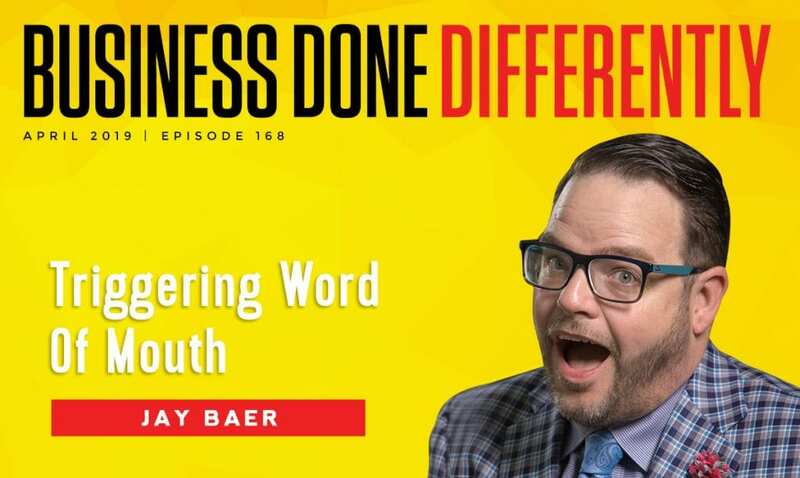 Jay Baer, a top expert on word of mouth marketing and a New York Times bestselling author, shares how word of mouth is incredibly important to every business. He states that 60% to 80% of business comes from referral or talk, and 50% of all purchases are influenced by word of mouth. Jay shares how you can leverage word of mouth to grow your brand and have success. Our guest is the top expert in the world on word-of-mouth marketing. He’s a New York Times bestselling author of six books including Hug Your Haters and Talk Triggers. He’s in the Professional Speaking Hall of Fame, the Professional Word-Of-Mouth Marketing Hall Of Fame and also the owner of amazingly ridiculous plaid suits. 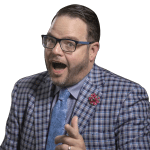 Please welcome Jay Baer to Business Done Differently. Thanks so much. Some of those things are true. I appreciate that introduction. I’m excited to chat with you as I shared Talk Triggers as one of my top books of 2018. You’re speaking the same language as me. I want to talk a little bit about the progression because you went from Hug Your Haters, which basically says customer service is the new type of marketing to Talk Triggers, where it’s word-of-mouth marketing, which I believe is everything. Tell me a little bit about this transition, a little of your background for context. It even goes back further than that. My first book, The NOW Revolution, was about social media is the new marketing and changing the way you hire and interact with the public. I wrote three books in the Youtility series, which is about content marketing is the new marketing. Customer service is the new marketing. Word-of-mouth is the new marketing, although it’s also old marketing. Each of those books ties together because what I do, not only on the page and on the stage but also in my consulting firm, is help business owners find ways to acquire customers less expensively than their competition is acquiring customers. It’s a money ball approach. Can you outflank your competition by being better at social? Totally. Can you outflank your competition by being better at content? Absolutely. Can you outflank your competition by being better at customer service? Definitely. Can you outflank your competition by being better at word-of-mouth? There’s no question about it as you well know. Word-of-mouth is, in fact, the most important thing. Not only that’s not a line that is mathematically true. Word-of-mouth is the number one way that people make buying decisions. That’s a fact. Yet it’s the one part of marketing that nobody has an actual strategy for. They take it for granted. They’re like, “Our customers will talk about us.” Will they? If so, what are they saying exactly? What we wanted to do in Talk Triggers that I wrote with Daniel Lemin is to say, “Let’s stop doing word-of-mouth on accident and start doing word of mouth on purpose.” We gave people a framework for doing it. You gave so many practical examples. You’ve got to love your customers more than you love your product. That is the first concept. It goes to how you create attention. You and I both agree that attention beats marketing 100% of the time. When you talk about Talk Triggers, the stats are unbelievable. 60% to 80% of business is coming from referrals or talk. There are a lot of different stats, is that correct? It depends on the type of business. In general, 19% of all purchases are driven entirely by word-of-mouth. Word-of-mouth is the only way that somebody heard about this particular product or service and made a purchase. 50% of all purchases are influenced by word-of-mouth. Word of mouth is one of the ways that people make a decision, 50% of the entire economy. In business to business, 91% of purchases are influenced by word-of-mouth, which makes sense. Nobody buys anything from anyone in B2B unless you’ve checked with a current customer first, like to not do that is foolish. Word-of-mouth is incredibly important to every business. Yet that the mystery for me was like, “If it’s so important, how come nobody has a plan?” We’ve got a plan for everything. You have a social media plan, content plan, PR plan, crisis plan, hiring plan, sales plan. Nobody has a word about the plan. It’s bizarre. We’re trying to fix that. I’ve been writing about talk triggers for several years, long before it was a book. Every once in a while, I’d write a blog post. I’m convinced to convert and say, “I call this a talk trigger.” I invented the term and would occasionally do a little case study. I never thought it was going to be a book. It became a book. Maybe one of my favorite ones is very simple. I bought like an outdoor fireplace, like a chimney thing at one point, many years ago. In the actual box that it came in, they had a stack of referral cards that said, “Everybody’s going to love this fireplace so much. They’re going to ask you how to get one. Give them one of these cards.” I was like, “That’s smart.” That is such an easy way to grease the referral skids. That was one of the first ones that I remember writing up as a case study. You have your starting point, but I always look at what are the friction points. In your books, you’re talking about Holiday World, the music park next to you. I was like, for us, what we started doing in our ballpark because we realize one of the friction points beside the fact that baseball is long, slow and boring that we’re working on is the fact that people get nickel-and-dimed when they go to ballparks. We did the exact opposite. We made everything, all our tickets, all you can eat, everyone includes all your burgers, your hotdogs, your chicken sandwiches, your soda, your water, your popcorn and your bird’s cookies for $15 total. That was a game changer for us. We never saw anyone else do it. I’m like, “Holiday World, well-played.” Share a little bit about that. Do you agree the starting point is looking at some of the friction points that the customers have? It was $4.50 for the bottle. The hotel wasn’t even in the park. It was in the hotel adjacent to the park. That’s not right. The Holiday World guys, Will Cook, who’s the son of Bill, who was running the park at the time said, “Expense is important.” It’s getting too expensive for people to come. They said, “Let’s make drinks free.” What’s interesting about that is Holiday World is the highest rating amusement park in America on TripAdvisor. They’ve got better ratings than Disney. Every single review of Holiday World on TripAdvisor mentions free soft drinks. It is such a definition of a talk trigger. People remember it and they discuss it because it’s so outside their frame of expectations. What I love about it is that there are two other benefits to this decision. One, once they moved to free soft drinks, actual people going to the infirmary or to the amusement parking nurse went down because people stay more hydrated because they don’t have to spend a bunch of money on drinks. They’re like, “Let’s drink throughout the day.” It’s outside. It’s sunny. Second, their trash bill went down. I used to be in the trash business. You probably don’t know that. Years ago, I worked for waste management. I was a trash man. I was at trash marketing. I can tell you a lot about landfill design. For an amusement park, their solid waste bill has got to be thousands and thousands of dollars a month. Once they moved to free soft drinks, it’s smaller cups. People take a four-ounce pour, six-ounce pour, and they finish that as opposed to what was happening, people would buy a whole bottle, a sixteen or a twenty-ounce bottle of soda. They drink half of it then they’ve got to get on the ride. There are no drinks on the ride, so they throw it in the trash. Half of their trash was liquid in bottles, which is super heavy. Solid waste is priced by weight, not by volume. They literally saved a bunch of money on trash by going to this free soft drinks idea. What happened at our ballpark, which I haven’t shared much is our per cap in the stadium went up dramatically because it’s like when you go to the cruise line and you get all your food. You’re like, “I’ll buy some more drinks. I’ll buy this thing,” because you feel like you’ve been given so much. You’re getting such a good deal on this side that you’ve got extra money on that side. Here’s the thing. There’s a bunch of other good books about word-of-mouth. Your book, there’s The Tipping Point. There’s Word of Mouth Marketing. There are tons of them. In fact, I wrote a blog post about twelve word-of-mouth books. It’s not like you or I invented this idea. What Daniel and I tried to do is give people a repeatable framework, an actual system for doing it. Because the worst way to come up with a word-of-mouth program is to brainstorm it typically. Some people can do it. You can do it. Most people can’t. If it was that easy, you already have one. What we wanted to do is give people an actual methodology that any business can follow. To say, “Let’s do word-of-mouth strategically,” instead of word-of-mouth haphazardly. It’s a four or five, six-system. Four requirements of a Talk Trigger, five types of Talk Triggers and then a six-step process for creating Talk Triggers. The four requirements, the four R’s, is it has to be remarkable in the classic sense of that word worthy of remark. It has to be a story worth telling. Nobody has ever said, “Let me tell you about this perfectly adequate experience.” It’s a terrible story, it’s not interesting to tell and it’s not interesting to listen to it. You have to do something that people don’t expect, like all you can eat at the ballpark or banana-scented tickets. They don’t expect that so that becomes a story worth telling. It’s the same thing with professional too, Jay. It’s like “I met the most professional person. I saw the most professional company.” When people say professional, I run. No one wants professionalism. They want unique, fun, interesting, talkable. Word Of Mouth: People get seduced by viral and by the big bang. It’s one of the great challenges in business. I talk about this every day that we have unfortunately convinced ourselves that competency creates conversation. It doesn’t. Competency is important for a bunch of other reasons. Mostly customer retention but nobody talks about good. They talk about different. That’s because of the way human beings are wired. This is a physiological issue more so than a marketing or business issue. You have to have the courage to do one or more things that customers don’t expect because that is what makes it a story that they will tell. It has to be remarkable. The other one that is important is it has to be repeatable. This is non-negotiable in our system. What that means is that every customer, every guest has access to your differentiator, to your talking trigger. Every guest at Holiday World gets free soft drinks. All of your guests get access to the things that you do at The Bananas. This is different though because there is a philosophy in the marketing of surprise and delight that you take one customer in a particular circumstance and you treat that customer much differently. The hope is that the customer will share content may be in social. It will go viral. Maybe it will but maybe it won’t. Even if it does, what are you left with? Also this idea of, “Let’s do a stunt,” that’s not a strategy. That’s a lottery ticket. I’m not big on lottery ticket marketing, I don’t think it’s reliable enough. Our methodology is that your talk trigger has to be accessible to all, not just your best customers, not new customers, not only in ladies’ night. It’s always. That’s what powers word-of-mouth every day, week, month, quarter, year, not once because what’s the point of that. That’s a big part of our system is that it has to be repeatable. It’s fireworks on Sundays or Saturdays. We’re going to do fireworks every once in a while or we’re going to have a bobblehead night. I get it, but spending money on bobbleheads isn’t cheap. I have a Jay Baer bobblehead so I know. It isn’t cheap. Instead of spending on bobbleheads, why don’t you make your customer experience better every day? Invest in that way. People get seduced by viral. They get seduced by the big bang. It’s a bad way to run your business. One of my favorites is from Skip’s Kitchen, which is a restaurant in Sacramento. Skip’s has a very simple premise. It’s a counter service restaurant. You order from the menu board when you want two patty melts, onion rings and a chocolate shake. When your food is ready, they bring it to your table. Skip’s has been in business for several years and was started by Skip Wahl and his wife. They have a line to get in almost every day. They were named the 29th best hamburger restaurant in America by USA Today newspaper. Their talk trigger works like this. After you ordered, but before you pay, the counter person whips out a deck of cards and fans that out face down in front of you and says, “Jesse, pick a card.” You pick a card, if you get a joker, your entire meal is free. Whether you’ve ordered for just yourself or a ten-person softball team, whatever the circumstances are. On average, three people a day win this game. When they win, they go crazy. They’re calling their mom crying. They’re putting reviews on TripAdvisor and Yelp. A high school marching band shows up. It’s a whole thing. It’s so effective that in Sacramento, even though there’s a giant neon sign out front, most people don’t call it Skip’s Kitchen. They call it, “That Joker restaurant.” Any business in the world could do that. They’re the only ones that do. It costs them some money on food, but they more than makeup for it, in the fact that they never have to advertise. You may have heard the same in the past. It’s not mine. It’s from Robert Stephens who is the Founder of Geek Squad, one of my business heroes. He’s an absolutely brilliant guy. Robert once said that advertising is a tax paid by the unremarkable. That’s not 100% true but it’s true enough. There’s a lot to be said that if your customers do all of your marketing for you, your work is done. I tell people this every day, “The best way to grow any business is for your customers to grow it for you.” There’s no argument on that, but yet most companies don’t have the courage to do something different that their customers will notice and talk about. That’s why you need a talk trigger. Even like you know yourself, obviously you’re speaking a lot more than I am. Whenever I go speak, I get more speaker request later that day or the next day because you’re in front of your other people. You’re creating that word-of-mouth of your fans that are spreading it. You don’t put things like, “Hire me.” It’s people spreading the word. If you’re good at it, there’s a saying in the speaking business which is, “The more you speak, the more you speak.” It’s like a geometric growth. People come up to me all the time or they call me or email me. They book me for events. They saw me speak years ago. I’m like, “I don’t do that talk anymore.” They’re like, “It’s okay, do whatever your new talk is.” I was in the audience that day and then my boss left and I got promoted. My other boss left and I got promoted again. They’ve been promoted three times. They’re in charge of booking speakers and they remember this event from years ago. In the book, you talk a lot about the DoubleTree Hotel. Everyone has a personal memory. I went and got surgery on my shoulder, I have to finish my baseball career and I was out of it. I was like, “I want a cookie from the DoubleTree.” That’s literally how I was. I was laughing the whole time. It’s not the best cookies in the world, but they’re known for it. What’s your story? What are you known for? When you look at all these companies, they try to be a little bit better here. I would say, “Better isn’t different, only is different.” What are you the only one doing it? It can be a small little touch. You can have some unique stories that are special but not your whole strategy is on that. For instance, I’m going to have a big golf cart. I want our players picking up fans in the parking lot and taking them in and playing the music of that to get an idea. For instance, we’re also going to do mobile car washes. While fans are in the stadium, a few of the dirtiest cars will be completely washed when they go to their car. Not every fan is getting that. You can still create those because those create good stories. What are those things? Every so game, every ticket that we had with scratch and sniff smelled like bananas. In our formula, that’s the best one. It’s the best talk trigger because it’s unexpected. It’s every customer. It’s every day. It’s every time. I love that. We have a customer that we work with a client on our consulting firm. It’s not in the book because it wasn’t done yet, but they make work gloves for working on an oil derrick. They’re based in Toronto. They’ve got a bunch of competitors that try and undercut them from Asia with lower quality gloves. They hired us to develop a talk trigger to emphasize to their customers that they’re a North American company and therefore, higher quality gloves. We went through the whole process, the same process we outline the book, and very strategic, thoughtful, customer interviews and customer journey mapping, not just brainstorming, rigor against this. Superior Glove is the company. What we came up with is on the back of each glove is their logo patch. When you scratch it, it smells like maple syrup. It’s scratch and sniff maple syrup work gloves. You’re swinging your pickaxe and you’re like, “Lenny, how can we keep smelling your hand?” It smells like maple syrup. Jay, we’re going to do our first game. It’s truth and dare. Which one would you like first? We’re going to do a game that we do at the ballpark. It’s called the sing off. We usually have between 2,000 fans versus another 2,000 fans. Now it’s you by yourself. We play a song as soon as the song finishes, you finish that song lyric. I’m bad at lyrics. This could be a real challenge for me. Give me something to talk about. You had figured that out talking to your head instead of singing. It’s Let’s Give Them Something to Talk About. It’s bad. You picked the worst possible game for me. I also picked one of the most fitting songs. Which is my walk on music action so I should know the lyrics. Is that honestly your walkup song? Yeah. I’m usually focused when I’m walking up. I’m not thinking about the lyrics. It’s going to be a real disappointment for you. Now, a truth. I ask a lot of guests this. You’ve had so much success in your career, but what is something that’s still holding you back from greater success? I was on a show once and somebody asked me, “How do you define success?” For me it works like this, I spend every minute of every day working with whom I want on what I want. If I don’t want to do it, I say no. That creates a tremendous amount of behavioral and psychological freedom. I could grow this company more. I could do a lot of things, but it would come at the cost of that freedom. I’m not wanting to make that trade. You’re working with a company, Jay, and it could be a whole workshop, a whole day of consulting but they’re on the outside. They don’t think like us immediately. How do you get them? I want to go back to not only a starting point but what’s an easy way? It’s not easy, but what’s a way that you can find something to make people talk about? I should have talked to you years ago because everyone that read my book, they’re like, “I can’t wear a yellow tuxedo.” I’m like, “That’s not the theme to wear the yellow tuxedo. It’s an idea.” It makes so much sense. I think what’s great, you gave so many examples. You basically have people call and get a free t-shirt. The t-shirts are awesome and ridiculous. That’s an easy touch. What type of company are they? They’re a manufacturer. They make wood products, wood trim, baseboards, crown molding and all that stuff. They give away tons of free t-shirts. Sometimes it doesn’t have to be directly linked to what you do if it’s a cool thing that people want. It’s a win-win. I would say that in most cases having it linked is better. It helps the story spread better if there’s not like weird dissonance there. Go back to the DoubleTree. Warm chocolate chip cookie every day for 30 years, they do 75,000 cookies a day. We did all the research on that and found that 34% of their customers mentioned the cookies. Every single day, 22,500 stories are told about that cookie, which is why you’ll never see a DoubleTree ad hardly because the cookie is the ad and the guests are the sales and marketing team. What’s interesting about that though was that their brand positioning is the warm welcome. It makes sense. If it was like, “Thank you, welcome to the Doubletree. Would you like a piggy bank for your kid?” You’re like, “I guess, but I don’t understand this.” The story gets stuck because it becomes weird. Why does that make sense? You said, “The create your because” statement. I thought that was brilliant. Can you share that, Jay? The idea is that we are doing this one different thing because of this other whatever, the end of that sentence is. If you can answer that credibly and logically it helps the story spread. It’s like the DoubleTree, we’re doing these cookies because it shows a warm welcome and that we care about you. A great example is the bank. They have the phone that you can call the president. Access is such an easy thing. Our president, we have a weekly show. Every single show, he gives my cell phone in the middle of the show and I get text messages at 1:00 AM, 1:30. How do you get access? That’s nice to have, or little touch points. I loved the Graduate Hotel. If you have keys, if you have something that people get from that, make it unique. It’s interesting that one of the things that we’ve observed, we talked about a little bit in the book. We spent more time on this point since the book was published or written. The more perfunctory and mundane the customer touch point, the easier it is to create conversations if you do one thing, a little different. Hotel room keys, they literally throw away. Let’s make those fake ID cards and make them collectible baseball cards. That’s a new thing. Sometimes the best way to go about this, when you map your customer journey, is you say, “What’s the piece of this that is the lamest, that people are like ‘Whatever?’” You put a little twist on that thing and it becomes a lot more interested or talkable. Word Of Mouth: The very best service is always unscripted that requires weight training, great people. Several people on my team and my strategy team have kids. I have kids too, but they’re older and cynical so they’re not good for this exercise. What we do is we pick kids who are between eight and ten years old. That’s the sweet spot. When we have potential talk triggers ideas that we have strategized through our process. We tell a kid the story, “What if you went to a hotel and you got to a chocolate chip cookie or imagine you were a carpenter and this company sent you a t-shirt?” We told them the story. A week later we ask the kid, “Remember that story I told you about the hotel? I forgot how that goes. How did it go?” If the kid can remember it and recite it back, then you know it’s memorable and simple enough to spread. It can’t be too complicated. If it’s a story that has multiple points, it won’t work as a talk trigger. You need simplicity. It’s the most boring points. We think about that too. Your voicemail that people answer. Your business card. We have all business card baseball cards that we’d make them collectibles. Think about every boring point and how you make that more exciting. That’s a win. I want to go into a talk trigger showdown. We are going to give some examples. I’ve never done this. I’m going to lose to the expert, but that’s okay. I’m going to name a type of business and you’ve got to name an idea for potential talk trigger. Here we go. I will play your game. We’ll do two then back and forth. Let’s go, a realtor. That’s why I say, “Whatever’s normal, do the exact opposite.” Literally, I posted an ad, “Do not apply for this job.” It gave every reason why someone should not work for us. We haven’t got that many applicants. That was the goal. You’re going to throw one at me. I’m going to throw one back at you. My son is only nine months old now. I’m not there yet. Preschool, so you show up. I would think again, how do you make it amazing in the beginning? We started bringing him to daycare and my son gets dropped off. It’s chaos. There are people running around. How could you have a valet service? A pick and go, almost like a pit crew service with the kids coming in. They’re known for the fastest drop off in the world and the fastest pickup in the world. That’s the friction point I go to because most people in preschool, the parents don’t know what’s happening during the day. They see in the beginning, they see in the end. I would think of a pit crew style dressed up as a pit crew, get the kid who didn’t get the kid out as quick as possible. That’s the pain point. The pickup-drop off is the worst. This one’s tough but it may be easy for you. Law firm. Here’s what I would do in a law firm and have an example about this. It’s an accounting firm but it works the same. These guys are called Bogdanoff Dages. They’re in Indianapolis. They’ve got dozens and dozens of Google reviews for an accounting firm, which in of itself is weird. They’re small guys, two principals and a couple of associates. They do small business accounting and personal returns. Bogdanoff Dages have a responsiveness talk trigger. They answer every client phone call and every quaint email in five minutes. I’ve had a lot of accountants in my day and a lot of attorneys. Many of them quite good, but I’ve never had a professional services company like that get back to me routinely with that speed. If that happened, what do I tell people about it? I would tell everybody I know about it. That’s one that you absolutely could do in a law firm. Do you have to make some operational choices and changes to execute that? Yes, you’ve got to make operational choices to wash people’s cars in the parking lot during the game too. 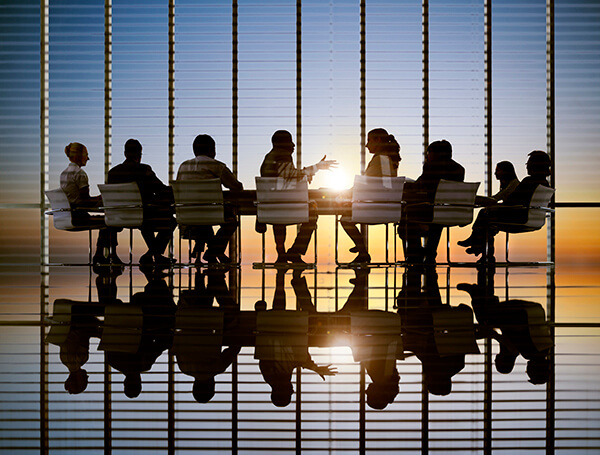 People are scared of tweaking their operations because it requires them to coordinate people inside the organization that doesn’t typically cooperate. It’s tough. If you want your customers to talk about you, you’ve got to get all play on the same team. The thing with these options for the business are speed, how fast can you get some done convenience and then is there a nice extra touch? You look at those three things and coming off that. I’m not giving you another one because you’ve already won. We’re going to flip the script here. Jay, you are the host of Business Done Differently so you can ask me any question. It’s a question I have been meaning to ask you so I can understand how people who work for the team get on board with your talk triggers because they’re employed by you. How do the players who cycle in and out of the team, because of the nature of Minor League Baseball, feel about it and do you ever get pushback or consternation from the actual players themselves? We used to get a lot of pushback. We have a full-time videographer, director of the film production. We’re developing the whole media team. We put out constant videos, constant content because we’re showing who we are and what we do. We set the tone from the beginning. When we recruit players, this is what you’re getting into. We’re fortunate we had a thousand players try to be a part of this discussion. We signed 30. That first day when they get here, the onboarding is so intentional. They get here. We have the whole block room set up with tons of different things. We have a talk. We bring in players to tell stories. We share our Fans First playbook, which is literally our core beliefs, everything we stand for. We have a nice lunch for them. Around 3:00, we go, “You’re going to have practice in an hour and there’s going to be 3,000 fans watching you practice.” They’re like, “No way.” I go, “Yes, there are.” I take some of that out. They see the lines to watch them practice. They’re like, “What are we a part of?” They practice and they sign autographs. We do a music video. We had them in the showers doing a Bananas are Back like the Backstreet’s Back, but in the showers doing this. They left the ballpark at midnight. By that day our coach said, “That’s the closest I’ve seen a group get in one day.” They understand what it’s all about. It’s sharing the stories over and over again. On our first year, I brought a choreographed dance instructor to teach the guys how to dance before they played ball. They were like, “What are we doing? We’re not doing this.” It’s taken time. It’s like any employee. You’ve got to get them apart or the fans. We’re going to move some rapid fire here. Obviously you’re working with so many different groups, speaking all over the country. If you want better answers, you’ve got to ask better questions. What are some of the best questions you’re asking people you’re working with? One of the best questions we ask is why haven’t you done something different before? Let’s go to marketing. What’s the best thing you’ve done to grow your own brand? It’s probably an oversimplification, but it’s the consistency of content and is very giving of what we know. My philosophy is taking every single thing you know and giving it away one bite at a time. If you say, “You can only know what I know if you pay us to tell you what we know.” That’s not a great way to run a business. It’s the way most people run expertise-based businesses. We’ve published 5,000 blog posts, 600 podcast episodes, 400 or 500 videos, just showing up. My boss once said when I had a boss, “Success is based on personal relationships, not inspiration.” There’s a lot of truth to that. One of the things that have made Convince & Convert successful and me as well, is that we keep showing up. We don’t miss a day. There’s something new on a blog every day. That’s the way it is. Over time that works and most people give up. Gary Vee talks about this. People have been working hard for six months and nothing has happened. When I first started, I used to be afraid of every piece of content you put out. You put so much out, it doesn’t matter. You keep sharing your beliefs. It’s okay to say the same things over and over in different ways. What about tool time? What’s the most important tool you have in your business toolbox? The most important tool is probably Sococo. It’s like Slack, but it gives you a virtual office environment. You log on and everybody on the team has an office. They’ve got an icon so you know whether they’re online or whether they’re in their office. You can go into their office and have a video chat or call people to a conference room. Our companies are all distributed. There are fifteen of us all over the world. We get together in person one time a year. To be able to have a tool that makes it seem more like we are in one physical space is indispensable for an organization like ours. You’ve been around so many companies. You’ve probably stayed at millions of hotels, so this might be a tough question. That’s what I call service. Is there one service experience that stands out? You’ve talked about your tuxedos as well, but anything that stands out for you? I don’t think I’ve written about this in a book. I was going to Australia with my wife to give a series of presentations. I’ve flown on Delta as I typically do. I had flown from Indianapolis to LA and from LA to Brisbane. We’re getting on the flight in LA. We get on a plane and a gate agent scans my boarding pass on my phone, looks into her magic box there and says, “Mr. Baer, thank you for your diamond status. We appreciate your loyalty to Delta.” They say that every time. That’s nice. She scans my wife’s boarding pass and looks at her magic box and realizes that my wife has very few frequent flyer miles. She says, “I like to take a moment to thank you, Mrs. Baer, for what you must be doing at home to allow your husband to spend so much time here on Delta.” Both of us walk down that jetway in tears, literally in tears because that was a true acknowledgment of her role. It was such a great service experience because it wasn’t scripted. It was about situational awareness. You can script great service. In fact, we do a lot of consulting on that. My book, Hug Your Haters, has a lot about that. The very best service is always unscripted. That requires great training, great people and most of all brand awareness. It’s listening carefully and respond creatively. You can listen by seeing things. Final three here, what’s one thing that you’ve done to stand out in business and in life? Certainly, I’ve got the suit thing. It’s not like a yellow tuxedo, but I am definitely the plaid suit guy. That’s my thing. You’ll appreciate this. We started this new deal where when I get booked to speak a week out, the meeting planner gets to send a link and it’s DressJayBaer.com and they get to pick which suit I wear. It drops on my calendar. I know what suit to pack when I leave for the trip. Many people don’t think about the simple things of attire. It could be a hat. It could be a necklace. It could be anything. They don’t think about that. What’s the best advice you’ve ever received? You can’t ever get too excited about your wins and you can’t get too disappointed about your losses because you’ve got another game tomorrow. Baseball is one of the best lessons for business and for life. Jay, how do you want to be remembered? I’d like to be remembered as somebody who went out of their way to help other people succeed and in so doing became successful. When I first read your book and read your story, I was beyond inspired. I shared it. You’re doing amazing things. How else can people connect with you and learn more about what you’re doing? The book itself, Talk Triggers, is available all the places in ways that books can be procured. It has an alpaca on the cover, so you can’t miss it. TalkTriggers.com is the website for that. 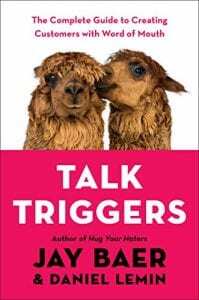 The book itself has a talk trigger, not just the alpacas’ thing. On the back of the book it says, “Satisfaction guaranteed. If you buy this book and you don’t love it unconditionally, send the author a note.” That’s me. “They’ll buy you any other book of your choosing.” That’s true. If you don’t like the book, you let me know and we’ll buy you anything. If you want the first edition Bible, we’ll track one down. Have you had to do it yet? Nobody has done it yet. The reviews have been perfect so far. I’m expecting somebody will eventually, which is fine. That’s our guarantee. No risk for Talk Triggers. You can find all of our stuff, all 5,000 articles, podcasts, videos, the whole deal at ConvinceAndConvert.com. Thanks so much for being with us, Jay. 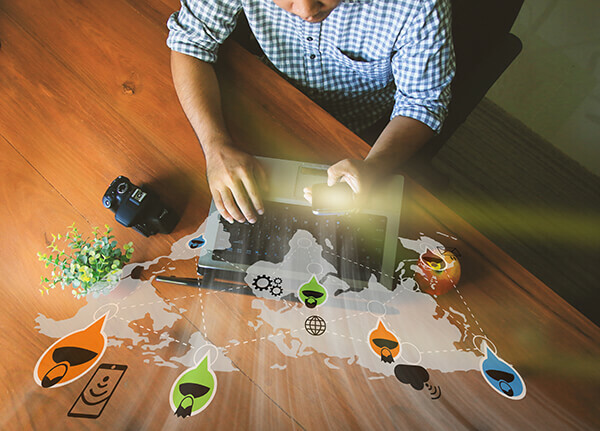 Jay Baer, CSP, CPAE has spent 25 years in digital marketing and customer experience, consulting for more than 700 companies during that period, including 34 of the FORTUNE 500. His current firm – Convince &Convert – provides word of mouth, digital marketing, and customer experience advice and counsel to some of the world’s most important brands. His new book, Talk Triggers, is the complete guide to creating customers using strategic, operational differentiators that compel word of mouth. In the best companies, the customers do the marketing. Talk Triggers is the instruction manual for making businesses grow with customer conversation. Hug Your Haters – Jay’s book on modern customer service and customer experience techniques – revolutionized the way business thinks about customer interactions and was named one of the top 3 business books of 2016 by Strategy + Business. His second book, Youtility: Why Smart Marketing is About Help not Hype, was #3 on the New York Times business best seller list, and a runaway #1 Amazon bestseller. Jay speaks approximately 60 times per year worldwide, often with lessons about how businesspeople can use today’s shifts in technology and consumer expectations to gain or keep more customers. Jay’s Convince & Convert blog was named the world’s #1 content marketing blog by the Content Marketing Institute and is visited by more than 250,000 marketers each month. Jay also hosts and produces the Social Pros podcast, which is downloaded 65,000 times monthly and was named 2015’s best marketing podcast by the Content Marketing Awards. He also has a weekly Talk Triggers show about word of mouth, featured on Youtube, and as a podcast. A fixture in social media, Jay has been named a top influencer of CMOs, B2B marketers, small business owners, and digital marketers. He’s also one of the world’s top Global Gurus in customer service and customer experience.